Apartment in Parque da Corcovada, Rua Jornal A Avezinha, Albufeira, Algarve, Portugal - Overlooking Gardens And Shared Pools, 10 Minutes Walk To Beach, Close to Restaurants & the Strip! This pleasant, well-situated apartment in Block 40 at the front of Parque da Corcovada, is a new concept in luxury and comfort. From the moment you enter the resort, you have the security of a private complex, with cool underground car parking from where you can take a lift directly to your apartment door. The apartment, which has Brazilian hardwood floors throughout, is a spacious, luxuriously-furnished lounge/dining room with patio doors leading out to the private balcony overlooking the landscaped gardens and swimming pools. There is a children's playground and crazy golf course at the nearby clubhouse. The resort is very easy to find, as it is located close to the Globe Roundabout in Albufeira, near to many restaurants and within walking distance of the beach, the Strip and the Old Town. There are many golf courses within a short distance, and the Waterparks are 20-30 minutes away! Bus stop close to complex, taxis easily available & it's easy to arrange coach outings to water parks or to tour the interesting villages, markets and places of interest in the surrounding area. Lots of water sports, quad biking, jeep safaris & diving also readily available. If you like an active holiday there is plenty of choice, yet if you want to laze around this quiet location is perfect too! We are a husband and wife with adult children, who first visited Portugal on honeymoon. Since then we have often visited Portugal and decided a few years ago to purchase a holiday home there, as it has so much to offer all age groups and interests, with glorious weather practically all year round. Since then we have made friends in the area, and really enjoy both family holidays and quieter holidays as a couple. We bought this apartment because of its location- quite private, yet only a short walk to the Strip, varied restaurants and many activities in the surrounding area. The apartment is very secure, well equipped and so spacious it suits our family get-togethers. We love this area because it suits all age groups, it's a year round location & only a short flight away! Only a short transfer from Faro airport the area around Albufeira has so much to offer-diving at many off shore sites, several water parks nearby, many marvellous golf courses, local markets, historic buildings, not to mention so many beautiful beaches, in fact something for everyone! If you want to relax you can laze by the pool, in pleasant gardens, dine on the balcony or just watch your favourite TV programme - why not? Main bathroom (en-suite) to master bedroom comprising of bath, shower over, wc, bidet and basin. Fully tiled. Towels provided. Shower room, wc and basin. Fully tiled. Air conditioning remote controlled in living & bedroom areas. Heating available from air conditioning & additional heater in lounge area. Washer also includes drier facility. Clothes airer provided for balcony use. Underground parking with specified space. Bathroom towels provided, but please bring your own beach towels. Large lounge with leather sofas, one being a double sofa-bed and a dining area with seating for 6. Satellite TV, 32" LCD TV and DVD player with selection of DVDs. Free wi-fi. Patio doors leading to the balcony, overlooking the landscaped gardens and pool. Toaster & sandwich toaster provided. Condiments & cooking oil provided. Large range of dishes, plates, glassware, & cutlery. Fully fitted kitchen with excellent luxury Siemens appliances - integrated fridge-freezer, hob/ oven, washing machine, dishwasher and microwave. Kitchen table and chairs provide an extra eating area. Well equipped with kitchen utensils. Large dining table & chairs in dining area. Smaller table & 4 chairs in kitchen. UK TV channels all available by Ethernet, including sports, films etc. Apps provide streaming for a wide variety of programmes. Thrillers, chick lit, adventure & biography. Games available via TV app selection. Wide range of music available via TV. Some board games & sand toys. Table & 4 chairs on balcony. Golf courses at Balaia and Salgados are just a short drive away. The world renowned courses of Vilamoura are a 15 minute drive away. Notes on accommodation: Top of the range VRV air-conditioning with one unit in each bedroom and one in the living room. It operates practically silently as the condenser unit is located on the roof, two floors above. Brazilian hardwood floors throughout the property. Outside: The apartment is on the first floor and has balconies to the front and rear. Table & chairs on main balcony. Access to shared pools through landscaped gardens on the ground floor. All patio doors have electrically operated shutters, which keep the rooms cool when you are out and about. Utility Room: Iron, ironing board, cleaning equipment, clothes airer. Vacuum system. Cleaning / Towels / Linen. Property is professionally cleaned for arrival and bathroom towels changed on a weekly basis. Please bring your own beach and poolside towels. Other: Spacious hallway with large storage cupboard. Intercom. Location is perfect. Just a few minutes walk from the strip and with lots of amenities. Pool is good size and lots of space. Apartment was perfect for family of 2+2. Thank you- it’s lovely to know when guests enjoy the apartment & the area. We love it & its location with so many lovely restaurants in the area to enjoy, makes it special. Three weeks without a working T V. Dimly lit bathroom due to faulty fittings. Position of apartment good but quite basic. Vastly overpriced compared with what others had paid. We are sorry that your holiday did not meet expectations, though we have never had issues before. Regarding the tv we were dependent on the availability of the engineer & he came as soon as possible. This is a new system installed in April this year. No-one else reported having issues with it. In the second bathroom the lightbulb was changed promptly but one needed a new transformer which was not immediately available. The best apartment you could desire for your holiday! Good position, good price and furnished with anything you could need! great communication and kindness of the owner! Thank you! O apartamento está bem situado perto de tudo o que é necessario para ter umas férias relaxadas, o unico ponto menos positivo foi a limpeza do apartamento. All the famous beaches of Albufeira are located a short distance away. Faro airport is approx 30km away and is served by many of the budget airlines (Easyjet, Ryanair, Aer Lingus etc). Different transfer options can be recommended upon request. 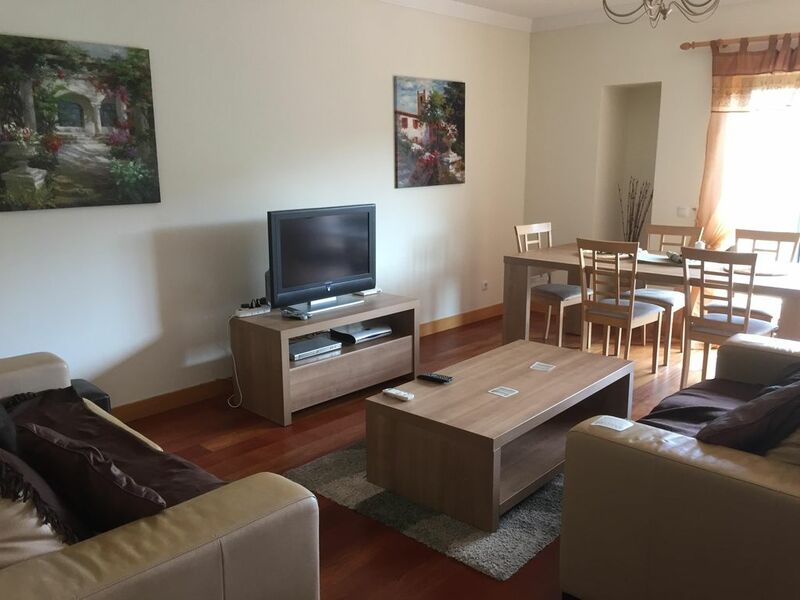 Apartment is located in a modern development at the edge of Albufeira Town, 5 minutes walk from The Strip, its many restaurants and night-life. Situated within 15-20 minutes drive of water-parks, golf courses and Algarve shopping, where there is a wide range of shops, bowling and English speaking cinema. Parque de Corcovada clubhouse across the road has a children's playground, crazy golf, bar and internet access (Payment according to usage). While the immediate area is a quiet one there are 3 supermarkets within 10 mins walk, 1 of which is close by. Many excellent restaurants in all price ranges in surrounding area, as well as a superior takeaway and several pizzerias close by. Many bars, sportsbars & nightclubs also are within 15 minutes walk for those who want nightlife. Indigo Divers shop is 5 min walk at St Eulalia, near the supermarket where there is a cash machine. Several other supermarkets in the area selling all the familiar food brands, as well as alcohol. Several trip booking offices and tourist information within 5-10 mins walk. Trips available to water parks, watersports, other parts of the Algarve, Lisbon, Spain etc. Taxis plentiful and reasonably priced. Booking Notes: Booking form will be emailed detailing the booking process and payment schedule. Changeover Day: flexible Notes on prices: Pricing in Euros can also be given. Discount given to repeat bookings and those booking longer stays.